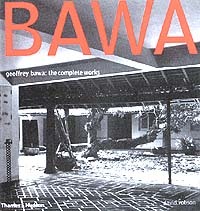 Geoffrey Bawa: The complete works. David Robson, published by Thames & Hudson, 2002. A handsome building has a way of insinuating itself into the consciousness much as a well-conceived painting would, or a piece of music which is in total harmony with its surroundings. A well-proportioned building does all that. Architecture, by its very nature, is public and therefore becomes an even greater art because it is exposed to a highly critical society whose judgements it must survive. Such has been my experience of the buildings designed by Geoffrey Bawa that, notwithstanding the theoretical arguments over style and fashion, I find in them an enduring serenity, a calm, and just at the same time, a certain poise and presence. Upon entering within such portals I find myself wholly enraptured in them in a quiet, contemplative kind of way. The spaces, the planes, the textures, the colours, the walls as much as the openings created in them or between them; and the materials, these are all fundamental to the experience of architecture. They dont all leap at you: they make their statements in repose, like the sound of music. And then there is the roof, the crowning glory that is an indispensable factor of any building which, says Bawa, "suggests itself." He has written that "the one unchanging element is the roof-protective, emphatic and all-important  governing the aesthetic whatever the period, whatever the place. Often a building is only a roof, columns and floors  the roof dominant, shielding, giving the contentment of shelter. Ubiquitous, pervasively present, the scale or pattern shaped by the building beneath. The roof, its shape, texture and proportion, is the strongest visual factor." Not only that: Geoffrey Bawa does not distinguish between exterior and interior but strives to bring these together into a single, homogeneous whole. Landscape and architecture are one. He believes that outside and inside are indivisible, that architecture involves a dialogue between the interior and the landscape and he maintains that no self-respecting architect would ever retain an interior designer. These also are familiar elements in the traditions of indigenous building which take into account the nature of the site. Trees are sacrosanct, boulders are natures gift. Landscapes grow out of them, vistas are created. They invite courtyards and verandahs and pools, spaces for living in and spaces for sheer pleasure. Entirely appropriate in the local context is Bawas use of inexpensive building materials  brick, timber, clay tile and plaster. Inevitably, too, the architect needs to be inventive and Bawa is credited with at least two innovative ideas: half-round clay tiles laid over corrugated cement sheets as both eminently effective and aesthetically satisfying; and the use of polished coconut columns with granite base and capital to protect them from termites. With these basic materials Bawa set out to break down popular prejudices and to build a delightful new world which, apart from homes for living in, provided spaces for prayer, places for the student and the worker, and retreats for the holiday-maker in search of peace and tranquillity. The enjoyment of this experience is an instinctive thing and why it is that Geoffrey Bawa believes that architecture cannot be taught: you have to learn it. Repeatedly he says: "Architecture cannot be explained: it must be experienced directly. It could be understood only in its own terms." These are the details David Robson, the author of a new book: Geoffrey Bawa, the complete works (Thames & Hudson, 2002), delves into while acknowledging the mastery of Bawa, the architect. He does this with great precision and thus helps to compensate for the readers inability themselves to enter the buildings and enjoy them at first hand as Bawa would have them do. Books are, alas, limited to the two dimensions of the printed page but such is his appreciation of his subject that Professor Robson is able to guide the reader and show him the way to the pleasures of the art of Geoffrey Bawa. In an infectious kind of way, he succeeds in communicating his own enjoyment of these works and it becomes impossible not to share in his enthusiasm. The book is very much, therefore, "a tribute to a man who saw architecture as a means to give pleasure to all the senses and to create a unique sense of place." The idea that "the ultimate test of a buildings design was to put it to use - if other people understood and enjoyed his building then nothing more needed to be said" is Geoffrey Bawas philosophy. David Robson demonstrates the validity of this assertion when conducting his readers through a vast and varied number of Bawas works. His task is greatly aided by an excellent portfolio of illustrations, photographs in colour and some in black and white; and architectural drawings, elevations, cross-sections and plans  the reproduced drawings suffering only from being too small to read. The author is Professor of Architecture at the University of Bristol. He met Bawa in the 1970s while he was teaching at the University of Colombo. David Robson also spent some years between 1979 and 1983 as an adviser on housing and settlement planning for the Sri Lanka Government and was involved in the Hundred Thousand Houses programme. BAWA is a plush, very handsome book. It must be recognised as the definitive study. It was preceded in 1987 by Geoffrey Bawa, a monograph by Brian Bruce Taylor published in Singapore as a Mimar Book in a series on architects in the Third World. The so-called "white book" was produced in tandem with an exhibition of Bawas work, first shown in London in 1986 and which was later to travel to Brazil, Australia and Singapore. Two names that recur from those days are those of Jean Chamberlin in whose house and on whose table the book and the exhibition were devised; and Christoph Bon, one of the two photographers who contributed to Lunuganga (Times Editions, Singapore, 1990), a pictorial essay on Geoffrey Bawas garden in Bentota: the other photographer was Dominic Sansoni. There are possibly as many "isms" in architecture as there are in painting and the discussion can become, for the layman, entirely academic. In explaining Bawas work, the author educates his reader sufficiently for him to appreciate the particularities of the art. Professor Robson diligently demonstrates the development of Geoffrey Bawa  through his early experience in Europe and his discovery of the vernacular elements in the architecture of Sri Lanka - into the colossus he was to become. An absolute constant has been Bawas delight in the right proportions, instinctively realised and assiduously applied. Geoffrey Bawas career as an architect spans some fifty years. He was thirty-one when, after completing an English tripos from Cambridge and then being called to the Bar, he turned to architecture. It was the beginning of an odyssey that was to see him return to Sri Lanka where the great adventure of rediscovering the country of his birth is to take place. It sees the architect in Geoffrey Bawa progress through a variety of situations to which most Ceylonese of his time were subject, beginning in colonial times and extending into periods of calm and encounters with violence in the years since Independence. His discovery of the island was a gradual process as Bawa "responded more and more to the context of Sri Lanka - to its climate, its physical resources, its social conditions, its culture and its ways of building." These were "simple points on a simple journey of exploration." It is his particular genius that he was able to absorb and transform these influences and to create from them a unique individuality. He was "continually reinventing himself. He was never a prisoner to his own past," says David Robson. "In the office he operated always at the centre of the team, directing, encouraging, cajoling and inspiring great loyalty. He would develop the main concept for a project, suggest a line of development and then act as critic and arbiter until a satisfactory outcome had been achieved. While he would scarcely have been able to function without his teams of collaborators and assistants, it was he who brought them together, who inspired them and directed them and who was always the leading spirit. And it was he who drove projects on site, demanding the highest standards from builders and craftsmen; with his last-minute adjustments he was the one person who could breathe the final magic into a design." An early and powerful influence has been that of Ulrik Plesner, the Danish architect who first came to Sri Lanka in 1957 to work with Minette de Silva in Kandy. Plesner joined Bawa in 1958 and this was to lead, until 1965, to a relationship during which time several projects were completed with the two working in close association with one another. The author asserts that "Plesner certainly played a crucial role in helping an inexperienced Bawa to find his feet and contributed enormously to the development of Bawas design  philosophy." Plesner also had a part in the re-evaluation of the architectural traditions of the country. He is credited by Professor Robson with beginning, in 1960, to record aspects of vernacular building, an exercise which was to be pursued by Barbara Sansoni and in which she was joined by Laki Senanayake. The results of this great undertaking were published, with texts by Professor Ronald Lewcock and Barbara Sansoni, in The Architecture of an Island (Lewcock, Sansoni and Senanayake: Barefoot, 1989). It is an exhaustive catalogue, beautifully drawn, of a continuous tradition that notes the past and observes the impact of other cultures on various buildings found around the island. Geoffrey Bawa conceded the impact of indigenous architectural elements in his own professional make-up. In an article appearing in The Times of Ceylon Annual 1958, he wrote: "In my personal search I have always looked to the past for the help that previous answers can give. By the past I mean all of the past, from Anuradhapura to the latest finished building in Colombo, from Polonnaruwa to the present  the whole range of effort, peaks of beauty and simplicity and deep valleys of pretension. I prefer to consider all past good architecture in Ceylon as just that - as good Ceylon architecture, for that is what it is  not Dutch or Portuguese or Indian, or early Sinhalese or Kandyan or British colonial, for all examples of these periods have taken Ceylon into first account." Friends and professional associates were to provide another dimension to Bawas work. He encouraged their work in his buildings: Barbara Sansonis handloom fabrics played an important part in the furnishing of hotels; he invited Ena de Silva to create the batik ceiling over the reception area at the Bentota Beach Hotel as well as the flags that embellish the Kotte Parliament on festive occasions. He commissioned Manjusri to paint the murals for the Parliament building illustrating the history of Kotte. Anura Ratnavibushana designed doors for the Bentota Beach Hotel and Laki Senanayake made, among other things, sculptures for Bentota and Kandalama, bas-relief friezes in plaster, did fine murals in line of exuberant tropical vegetation for The Triton at Ahungalla and the spectacular chandelier that hangs over the main chamber of the Kotte Parliament. The Parliament complex, Ruhuna University, Kandalama Hotel in Dambulla and numerous other public buildings vie with each another to be nominated as Bawas single masterpiece. Professor Robson refers to the Bentota Beach Hotel as one of the first of them and bemoarns what he calls the tragedy that overcame it after redevelopment. That took place in the 1980s when the hotel passed into private ownership and the new proprietors decided to "modernise" it and in doing so "expunging every element of quality from the building. The clay roof tiles were replaced by green metal sheeting, the courtyard was tidied up, the podium extended and the reception areas remodelled." Many private homes could equally well be nominated masterpieces: the Ena de Silva house in Colombo, for instance. Bawas own garden at Lunuganga in Bentota is another masterpiece which has grown over the years, "a place of many moods, the result of many imaginings, offering me a retreat to be alone or to fellow-feel with friends." A lorry driver who once walked around the garden while his bricks were being unloaded observed: "But this is a very blessed place." It is, like his home in 33rd Lane, Kollupitiya, private; and that also is a masterpiece. Indeed, I would not care to make a judgement as to which of his enormous output could be nominated his one masterpiece. His work has been consistently beautiful. And it has had far-reaching impact in the immediate vicinity of Sri Lanka, in India, Mauritius, Bali and beyond and Bawa has received due accolades from around the world. In Sri Lanka he is a Vidya Jothi and a Deshamanya but perhaps the most prestigious of the honours bestowed upon him would be the Aga Khan Award for Architecture which he received in 2001. Professor Robson it was who delivered the eulogy on that occasion. It now must be seen that his proteges will proceed to uphold the canons of good taste that Bawa championed. Channa Daswatte is, perhaps, the immediate heir-apparent to this legacy. There are others: Nihal Amarasinghe, C. Angelendran, Pherooze Choksy, Sumangala Jayatilleke, Milroy Perera, Stanley Perera, Ismeth Raheem, Anura Ratnavibushana, Turner Wickremasinghe. Professor Robsons has been a gigantic task, cataloguing the work of an architect who was ever in demand and who accepted his briefs (or challenges) cheerfully, particularly if they came from agreeable clients. Covering a lifetime of activity, the book discusses some 50 projects in detail. These are illustrated, as I said before, with excellent photographic spreads and with technical drawings. They satisfy the reader at two levels  the layman for whom, ultimately, these buildings are made, and the professional who is, forever the student, as indeed, I think, Geoffrey Bawa was. He was responsible for more than 200 projects which were either brought to fruition or were to remain unfulfilled on the drawing board. It is also the authors achievement that in his narrative, he recognises his subjects personality as ideas proliferate and beautiful buildings rise to become, eventually, testimony to a great artist, uniquely of Sri Lanka. Geoffrey Bawa suffered a devastating stroke in March 1998 which was to leave him partially paralysed. It is a matter of inconsolable regret that he is today quite unable to participate in the celebration, as in Professor Robsons book, of his lifetimes achievement.